600D polyester, faux leather bottom backpack. 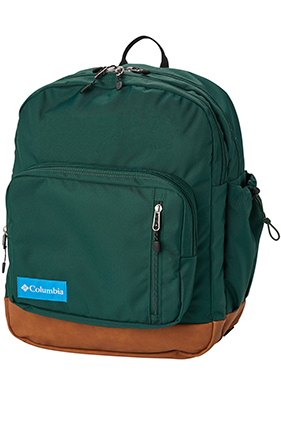 Contoured padded shoulder straps, padded back. Top carry handle. Dual main compartments with padded laptop sleeve, fits most 15" laptops. Front zippered pocket with organizational compartment. Front vertical stash pocket. Top lined accessory pocket. Drawstring side pocket.